First off I am no great expert on this subject, but have played around with a few different ways of doing things, so wanted to give my opinions of what works for me at least. If you’re looking for a how to do this, I’m not planning to go into detail of that now—although I might another time. However, I would say that Vassal seems to be best option as it gives a lot of flexibility, is free to use and has some miniature wargames modules already loaded that you can learn from. Why Create Virtual Miniature Wargames? Software like Tabletop Simulator and Vassal are designed to simulate the experience of a board, card or miniatures game on the computer. They don’t recreate a computer game where all the calculations are automated and the player doesn’t have to know the game mechanics. The idea is that you don’t have to have the pieces of card, plastic or metal in front of you to play the game—these are all represented using digital images on the screen—including the board or table. But if that’s the case, what’s the point? There’s a few reasons. The ability to play with people at a distance rather than face to face. Not something that was an immediate need for me. Guilty secret—it’s a way for people to play these games at low or no cost. One reason GW bans publication of Vassal modules on the Vassal site. However, other publishers are more chilled about that – the probably realise that having this version doesn’t replace the real experience, and in fact probably helps nurture it. Also I don’t think usage is that high. I don’t have space for a miniatures games table more than 2 x 3 foot, so playing larger games would be impossible any other way. At the moment for physical games I am restricted to smaller, skirmish style games – Hobbit Strategy Battle Game for instance. To play a physical tabletop game, you either need a good block of time – half a day at least perhaps, or can leave a table set-up until the next gaming session. I have been able to do that sometimes with our 2 x 3 table, but that’s not always possible. So having a virtual table that I can save and come back to is a great asset for playing a longer game. My ideal situation was to be able to try out some wargames periods and rules sets that I wouldn’t have the opportunity to on a real tabletop – again for the reasons above. My aim was to get more familiar with some of the most popular rules on the market – for instance De Bellis Antiquitatis (DBA) for Ancients and Medieval, Field of Glory for several periods, Bolt Action for WW2. The need was for something that was quite customizable and easy to use. Visual appeal would be nice to have, but not essential. I had come across two examples of Virtual Tabletops previously – Vassal and Tabletop Simulator. Vassal is free, very customisable, but doesn’t have the 3D engine that Tabletop Simulator. That 3D engine comes at a moderate cost – I think I paid £14.99 on Steam for it, but given that amount of games you could play with it that seemed reasonable. I’ll start with this one first. I had learnt enough about it to be able to play the Lord of the Rings Living Card Game, so I decided it was time to try some of the wargames. That’s where I came a bit unstuck. When I downloaded some of the wargames modules – e.g. for Warhammer or Bolt Action, I was presented with a load of models, some of which wouldn’t load properly. That meant going and actually watching some tutorial videos and looking up why the image files wouldn’t load. Having successfully done that I started off with a simple Horse and Musket game – really just a battle that someone had created rather than a whole game set. The main issue with Tabletop Simulator for simulating wargames became quite clear at this stage – it doesn’t seem to have any way to actually move several individual models and keep them together. You can select several items and move them, but when you put them down again (unless you’re very careful) they tend to fall over or move around. The way round this is to create units with several figures on a base, but that requires digital modelling – something I could probably learn to do, but not at the moment! I think for skirmish games such as W40k, Bolt Action this would be OK, but since I am not planning to learn the rules for those games just yet, at this point I decided to leave the flashy 3D graphics of Tabletop Simulator behind and try Vassal. To my surprise and delight I found that there was actually a Vassal Module for De Bellis Antiquitatis. I hadn’t read the rules yet, but I knew that the unit bases for it would work well with One Hour Wargames rules that I had used with some card cut outs. So I plunged into this. As setting up a game was a simple process of dragging bits of scenery and units onto a board and then moving them around using the ruler provided, that was pretty simple. However, I then realised that I had no easy way of recording casualties. The One Hour Wargames system gives each unit 15 hits before it is destroyed. The module for De Bellis Antiquitatis naturally didn’t allow me to record that, so I had to think about being able to customise the module somewhat to ease the bookkeeping – I didn’t want to try to keep track of hits outside the actual Vassal software – after all it felt that the point of having a simulator was to help with the paperwork too! I read the whole Vassal module creation manual – about 150 pages, but actually quite a quick read and easy to follow, and fairly soon I had the skills to add a text box to each unit that I could edit when they took casualties. See below for a picture! I was quite proud of that achievement and decided that Vassal would probably be the system I would work with for the moment – I was competent enough to either edit current modules, or maybe even create my own to make the wargames I wanted to. Having tested editing a module in Vassal. I think the next step for me is to use it to play a few games of DBA and learn that system. Then I would like to take a look at Bolt Action as there’s a module for that too – and then probably work through creating some modules for a few Ancients and Medieval rules such as Field of Glory, Warmaster and Warhammer Ancient Battles. These would be for personal use – I wouldn’t post on Vassal given the copyright issues! One of my ambitions is to collect again some of the miniatures I owned as a kid when I played Warhammer – nearly 30 years ago in the mid to late 80s. I’m not sure if this is one of them or not – but I certainly had a number of the Townspeople and other general human types. This is from the C04 Thieves range and according to Stuff of Legends his name is Picker Pete Lightfinger – see below for the original catalogue image from the 1986 Citadel journal – and he was designed by the Perry twins. So another miniature from Hobbit Strategy Battle Game that I painted fairly recently – this time Eowyn. She is also doubling as an Elven magic user from the D&D game I play with my son and at his request her dress is white to tie in with the D&D character – otherwise I tend to be a bit boring and try to copy whatever I see in the official Hobbit or LOTR rule books! I tried proper layering for this one – so the white dress starts off with a brown base and then gets built up – up close in the photos you can see the nuts and bolts of this quite clearly but from more of a distance this looks better I think. I think I probably need to work on the photography a bit – this is just using some card a smartphone and some lamps – but hopefully you can see it ok! 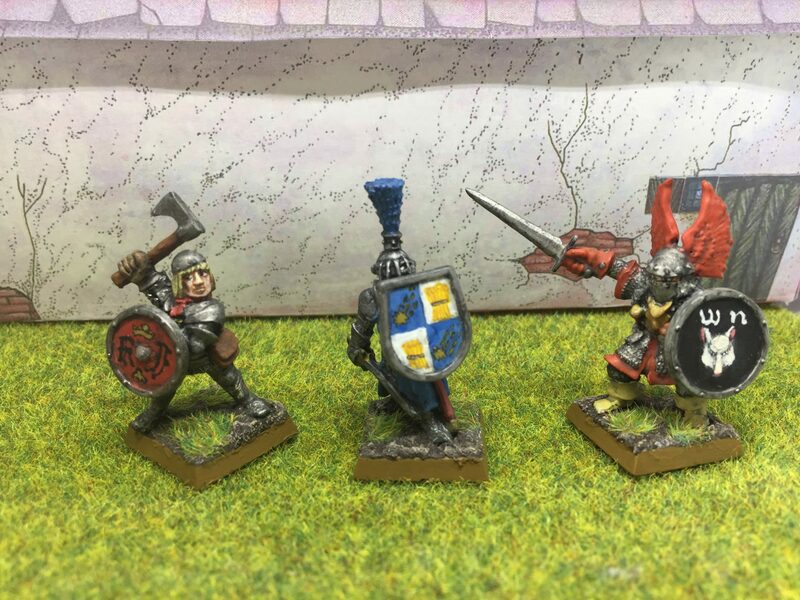 I have created a new tutorial for the Field of Glory game – this time looking at how to choose an army using the Digital Army Generator. Also experimented using a narration for the first time with a microphone – a bit easier than I thought it would be – although I realised that sometimes a bit of a script or practice run would have helped! It’s a bit simpler than other Total War games – which is no bad thing – the interface has less clutter and units for example have fewer special powers, which makes battle management easier. There’s no prologue campaign to wade through – which again is good – you just go and decide which faction you want and get going – although the advisor tips are quite heavy to start with. It’s genuinely fun and I wanted to keep playing. I think partly because there’s no concerns over historical accuracy, the silly stuff like battlefield artillery feels right, whereas in other games like Rome it seems out of place and contrived. The Warhammer world isn’t quite the one I knew and loved from Warhammer Fantasy Battles 3rd edition – some of the humour has gone and been dumbed down into things like shouting Waarggh! a lot. The orc animations look a bit daft to me, but that’s down to the direction Games Workshop went with figure design. But I think Creative Assembly seem to have faithfully recreated Warhammer as it was before Age of Sigmar. The factions are quite few – again this is good – with a game like Rome II I just feel overwhelmed – I’d like to play all the factions, but I feel I never will and anyway how different are they. But with this playing a campaign with each faction seems manageable and they also feel quite different too. Battles work quite well and basic tactics work better than other Total War games did before getting lots of patches. They seem to have got things right from the start this time round. I found some of the graphics disappointing – I think it’s the underground battles actually that look a bit rubbish. Overground it all looks a lot better. Here’s a screen capture video of me opening the game – it shows the opening video and the start of the Greenskins campaign. As you might know if you interested in strategy PC games, Total War: Warhammer is just around the corner – due for release next Tuesday! I’ve already pre-ordered and can’t why to play. Here’s my top 5 reasons to be excited about the new game. I stopped playing though when I left school at started University – a couple of games while at Uni, but that was it – I finished with Warhammer on it’s 3rd edition. So it’s fascinating to go back to the game and see how it’s developed. I also love Total War games – again getting into them right at the start with the first Shogun game. Somehow I still think that was the best – battlefield tactics somehow just worked better – a bit less real time rushing around perhaps? I’ve been looking for a Total War Warhammer game for ages. There’s some mods but an official game is where it’s at. There’s some great new features for the game that will make it unique for Total War games – flying stuff and magic. I can’t wait to play with those things. Also the idea of Orc and Dwarf nations that don’t follow the standard nation building rout of these games will also be fascinating to play. I think I might start with the Orcs! Perhaps if Creative Assembly pull off this game, they’ll get the change to do Lord of the Rings Total War – or Game of Thrones. A strategy game for either of those licenses would be awesome! Here’s a trailer that hope will get you excited as well!